At what age is it appropriate to discuss natural disasters? 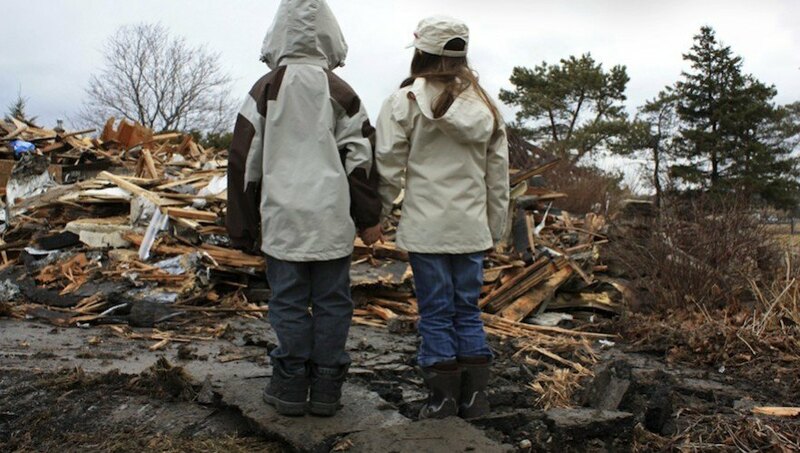 If your child knows that a natural disaster has happened, or if the family has been directly affected by a disaster, then it is appropriate for a parent to discuss the situation with their child. For families who have not been directly affected by the disaster, it’s okay for the parents to not bring up these discussions. But, it really is a family’s choice. How do parents discuss such incidents without scaring their children? Give the facts. Talk to your kids with simple words. Follow your kids lead so you can sense how much they want to know about the situation. Offer comfort. Sit close-by to your child and maybe hold them. Focus on safety first. Tell them that you want to take care of them, that what they are seeing is scary, but that mom and dad are there for them. Try to do familiar things after discussing the incident with your child, like singing a song you both like, or telling a story. Stick to predictable routines. For example, stick to bedtime, storytime, prayer and cuddle time. Make sure you allow kids to express their feelings. Have kids identify how they’re feeling. Make sure they name their feelings when you’re talking about the disaster such as scared, anxious, worried, or angry. Tell them it’s okay to feel that way. Help them to express their feelings in different ways — by talking, playing, or drawing. Parents need to remember that difficult feelings can create difficult behavior. Make sure we show the child the right way to behave. So, you might say, “it’s okay to be angry, but it’s not okay to hit.” This way we identify the behavior as not okay, but still validate their feelings which are okay. The more parents can help their children express themselves, the more we can help them feel better. Remind them of what is good and steady in their lives, so they can feel hopeful and safe. Highlight positive stories that come out of the disaster, like how people have helped each other, and that there is rebuilding going on. Have the discussions during the day, not before bedtime, so children have the opportunity to ask questions as they come to them, and have the questions answered. Bedtime should be a calming time; we don’t want to increase their anxiety then. Keep in mind that young children tend to ask the same question repeatedly. This repetition is their way of trying to process difficult information. Parents need to be patient with them. We keep honestly and simply answering in a reassuring way. Show children where the emergency supply of food and water is stored. Walk them through the emergency plan, so they can feel safe knowing how they should react in case they experience a natural disaster. Is it okay for us parents to share that we too can feel scared about natural disasters? Absolutely! It’s important for us as adults to express that this is a scary situation and that all of us can be scared. This openness allows kids to express their feelings of fear or anger or sadness. Any more words of advice for parents? It’s important for parents to take care of themselves during these times. We’re the ones who tend to see more of the media images. We need to be sure to turn off the TV, radio, or internet so we aren’t overly focused on all the disturbing news. Make sure you are sleeping right and eating right. It’s a great idea to talk to others when we’re feeling overwhelmed by what we’re seeing. A good way to comfort ourselves is to get educated about disasters. Parents need to do things for themselves and give themselves a break, whether it’s working out or family activities. As we capably cope with our own fears and anxieties, it presents wonderful modeling for our children. Dr. Melissa Brymer is Director of the Terrorism and Disaster Programs at the UCLA-Duke University National Center for Child Traumatic Stress. The Mother Company aims to support parents and their children, providing thought-provoking web content and products based in social and emotional learning for children ages 3-6. Check out the first episode of our DVD series, “Ruby’s Studio: The Feelings Show,” which teaches kids how to express their feelings. We want to be a parenting tool for you! Great advice. I had to be careful about watching more of the Japan coverage than I could handle. I watched just enough to be informed and donate to the Red Cross, but that was about it.